Concept: A distiller from a family trading post off of I-94. This young woman has something of a gentle face framed by light red hair – the kind of red hair that has to be examined two or three times to determine that it is, in fact, red. She has big green eyes and a large mouth with an oversized nose to match, though thankfully it is blunted and not pointed or hooked. Her skin is creamy and otherwise unmarred. Frankie’s form is a bit on the short side, about 5’5″, weighing in at about 120lbs – though close inspection will indicate that she’s seen a dramatic loss of weight recently. For those with a keen eye, a few scars along her wrists might be visible. Her clothes are simple and utilitarian – no frills Frankie you might call her. She prefers fitted jeans and boots, with any collections of tops or t-shirts that she can scrounge to fit under her leather jacket – the staple of her wardrobe. * A gnarly-looking scar on the outside of her right thigh, about the size of a fist. * Scars along her wrists, similar to cuff marks. * A Catholic medallion bearing the image of some saint or other, worn at all times but often under her clothes. Frankie Farnsworth has an independent streak a mile wide. She is resourceful and exceptionally down-to-earth. She believes that hard work and ingenuity will get a person everywhere, and that nothing comes free. As a result, she is proud and protective of what she has. Honesty and respect are her guiding principles. Organization and collaboration, with everyone pulling their own weight, means survival. Frankie started out in Madison, Wisconsin. Her parents met in school there and started their life there. She was 13 when the virus hit, and her independent hipster libertarian parents brought her up to a family cabin off I-94 to wait it out. They made the little place into a home, even without power or running water. What they didn’t know how to do they learned or found ways to do. It was all about resourcefulness in the Farnsworth family. Being resourceful, Frankie’s father – who used to home brew – started a still where he’d make bathtub gin to trade down by the highway. Eventually the family got a little stall down there, a bit off the road, which became a meeting place for other people scratching out a life in the wilderness off the highway. They called it the Pub and they traded their brews for other things, and traded those things for other things. It kept them alive. It worked for almost 18 years, when a hoard from a recently-fallen compound swarmed the cabin. Frankie escaped and fled toward the highway to seek help. She found it in the form of the I-94 gang, who picked her up and made her a “girlfriend” — a position that led Frankie to be passed around to the gang members and auctioned off, eventually purchased by a man named Caleb. She survived with them for the better part of a year before she was traded to another man, Jimmy. It was then she managed to escape and fled to the Outpost. Upon arrival at Outpost 39, Frankie was taken in by Dr. Miette Sabourin in November of 2033. She spent a few weeks collecting supplies and materials and eventually was able to turn Dr. Sabourin’s basement into a fully working distillery. She produced potato vodka and gin, in addition to medicinal alcohol. She eventually built a bar in the Cafeteria and begin to manage rationed drinks for the community. In January 2033, much to her own surprise, Frankie was elected to be one of the three members of the governing council for Outpost 39. The Outpost fell to Tom Briar and his men a few short weeks later. 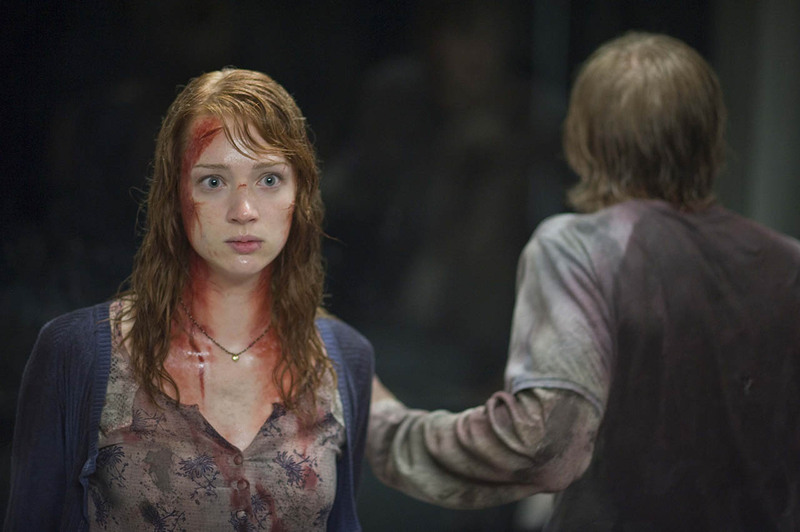 Frankie was taken prisoner for the duration of the evacuation from the Outpost, though she was able to help negotiate the peaceful evacuation. Once at the Camp, the Council drafted and passed a new governing Charter for the community. Frankie resigned her position on the Council on May 29, 2033. She currently lives in Raccoon Cabin with Gene Dresden, with whom she is romantically involved. All recent history is common IC knowledge. 12/16/2015: On the Road again! - Frankie, Gene and Tessa head off to Outpost 39, they run into a little snag along the way. 11/20/2015: A Storm of Swords - Sparring at the Adventure Nook draws a crowd. 11/17/2015: A horse is a Horse - Frankie and Gene take a walk in the woods and find a horse. 11/16/2015: Dinner at Raccoon - Gene makes Dinner, Frankie catches him out of bed, Tessa stops by with a gift. 11/16/2015: Foreign Policy - A Council Meeting. 11/11/2015: The Ellis Sisters Arrive - Rachael and Rebekah Ellis arrive at camp, greeted by Frankie and Maxim on gate guard duty. 11/11/2015: Trade My Sunshine - At Chava’s recommendation, Frankie goes to see Will and makes a trade for some seeds. 11/11/2015: It Stings - Chava checks up on Gene’s injuries, and some drama is revealed.